English as a global language has become one of the keys to the economic growth and educational opportunity. On May 23, 2011, British Council in collaboration with the Centre for Languages at BRAC University organised a special lecture, titled, 'Global Trends in English Language Teaching,' conducted by the world renowned English language expert David Graddol. 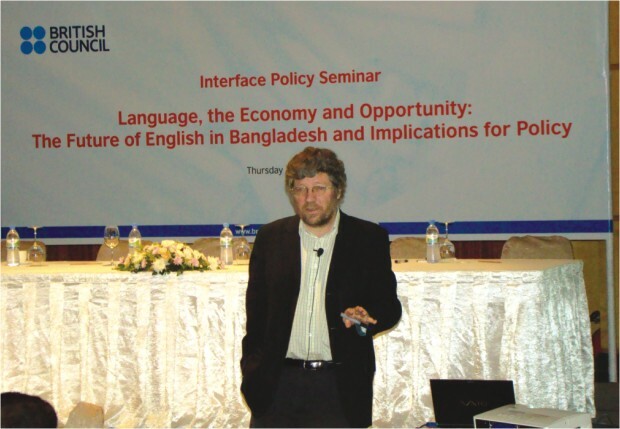 A famous writer, broadcaster, lecturer and consultant, David Graddol has published several important research and policy documents on issues related to global English. Some of his major publications include 'The Future of English?' and 'English Next,' exploring the growing importance of English in different sectors like global education, economic development and also the role of English in globalisation. Teachers, graduates, researchers and students from different public and private universities joined the lecture. Charles Nuttal OBE, Director, British Council addressed the audience marking the opening of the event, while Dr Ainun Nishat, Vice Chancellor of BRAC University and Lady Syeda Sarwat Abed, Director, Centre for Languages, BRAC University also graced the occasion by speaking to the participants. Delivering his lecture, the prominent English Language expert David Graddol spoke on the changing trends in teaching English and also other significant issues such as the economic and demographic changes which affect the ways English are being used, taught and learnt around the world. The global environment for the English language teaching has changed dramatically over the past few years. Graddol updated the audience with the facts and figures on global trends in education reforms in different countries. The researcher also discussed different issues regarding the new and innovative ways in teaching English as a foreign language. Previously the teaching of English language has been a technical issue. However, recent developments represent a response to the changing needs of learners and new market conditions. Currently more emphasis is being put into the communicative modes of teaching the language and also engaging the learners in the teaching process. Today more people are willing to learn English than ever before and most of these learners are young in age. Screening audio visual presentations, Graddol projected statistical analysis of changing relationships between English and the other major languages in the world. He also identified some of the challenges that English might face in its competition as the lingua franca with the other major languages of the world. English as a mode of communication is no longer under the authority of its native speakers. The future development of English language is now being suggested by its non-native speakers and the trends in teaching English as a global language is changing everyday with the varying needs of its users and learners.